Ever wanted to see a gift with purchase that will make you fly and never grow old? 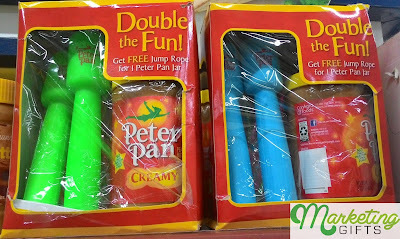 We know that that’s still a long shot from our current reality, but you can get closer to that dream with Peter Pan Peanut Butter’s free jump rope one jar at a time! A Big Hit for Kids. Children love toys that they can share with their friends or siblings. This free jump rope that Peter Pan has? It is a big hit for kids since they all seem to love to jump and do tricks with a rope. Pull In More Sales. In the grocery store where we found this marketing product, only two packs were left on the shelf. This means that all other packs were sold already, and more sales were pulled in by the company. Great for Brand Visibility. Promotional ideas that make use of merchandise where anyone can see the brand name clearly are effective at making the brand more visible to more people than you can expect to see them. With a branded jump rope like this, the brand logo is very much seen because it’s placed on top of both handles of the rope. Are you thinking of including toys in your regular merchandise as well as a freebie? Visit our blog or contact us at Marketing Gifts to get more ideas on how you can pull it off.